Where Can I Find Ram 1500 Trucks for Sale Near Me? Are you asking yourself, ‘where can I find new & used Ram 1500 Trucks for sale near me?’ South Pointe Chrysler Jeep Dodge Ram proudly offers an exceptional selection of new, used & certified pre-owned Ram 1500 Trucks for you to browse and test drive in Tulsa, OK.
Why Choose the RAM 1500? 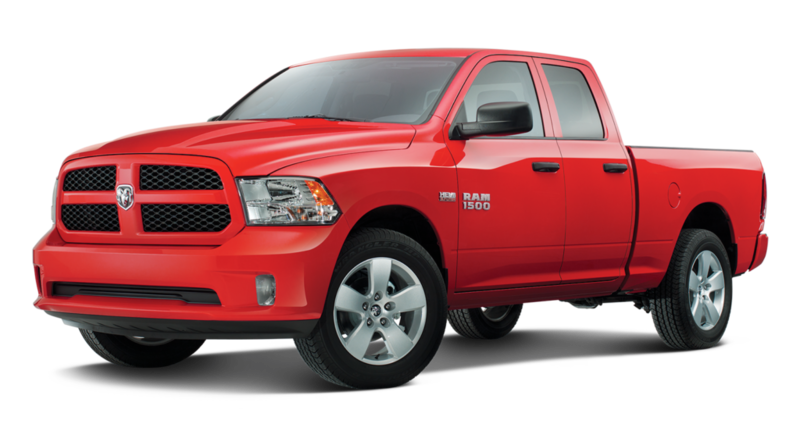 There are a whole lot of reasons why the RAM 1500 warrants the accolades and awards it has been given over the years. Though, if you’ve never had the thrill of driving the flagship of our line of trucks, we highly recommend clearing your schedule before taking your position behind the wheel. Whether you’re looking for a beast of burden or a chariot fit for a king (or queen), the RAM 1500 comes in a trim line made to meet your particular needs. Wish for a roomy interior packed with the latest automotive technology or ample freight room to move your world? If the RAM’s superb lineup doesn’t have it, it doesn’t exist… yet. The 2018 RAM 1500 isn’t just another pretty face. We’ve loaded our front runner truck with all of the advanced engineering technology worthy of the label “RAM”. From our legendary HEMI ® powered engine to our Torqueflite ® 8-speed transmission and custom-designed RamBox ® cargo management system and significantly more, the RAM 1500 is your passport to pickup truck nirvana. We know you put your most valuable treasures in our trucks. That’s why our team put the most state-of-the-art safety and security technology in the 2018 RAM 1500. Our utmost concern is making sure you and your family get to point B safe and sound. Visit South Pointe Chrysler Jeep Dodge Ram today to test drive a new, used, or Ram certified pre-owned Truck in Tulsa, OK. Our team of Ram professionals are ready to help you find the perfect vehicle. Search our stock online, visit our showroom, or call (918) 584-1481 to learn more. We look forward to serving you soon! Blackjack did a fine job, I was doing quite a bit of service items to my daughter’s car before she takes it out-of -state. Got a battery, wiper blades, fuel-injections service, oil change, tire rotate . . . .
Our sales rep was James Wyatt and the sales Manager was Matt, both of these guys were flat out amazing, the guys went above and beyond to make sure we had a great experience, we went in the night before told him what we wanted, they did not have the vehicle on the lot and told us to come back in the morning. When we arrived this morning they had the Jeep brought in over night from OKC. Due to us buying a car on a Saturday and them only having one finance guy there we were there a little longer than normal, I would still recommend buying a vehicle from them every business gets busy and we knew that so it didn't bothers us. I will be purchasing another vehicle from them when its time to do so. Quick repair and service on my ram box issues. Also took care of recall issues while in the shop. Friendly employees, good service, prompt with responses to questions and concerns. Service Department quick and quality great. My Jeep needed further work due to things they found under warranty. Ordered parts and will be done at my conscience. Great work! This is a great place I even bought my son his 1st new car here. Went to all other local dealers and they were the best for trade and ordering my vehicle.. Process was the easiest ever..! This was the second vehicle I've purchased from South Pointe and was easy then to go through the entire process. ! Thanks guys. !